Wolves winger Michael Kightly has ended any speculation about his immediate future by signing a new long-term deal. The 22-year-old missed most of last season through injury but has agreed a four-year contract at Molineux. "We're delighted. He's made magnificent progress since we signed him," chief executive Jez Moxey told BBC WM. "He's been a model professional both on and off the field and had he not missed 29 games last season, our situation may well have been different," Moxey added. Kightly made a huge impact at Wolves after his move from non-league Grays Athletic in late 2006 and was rewarded with three England Under-21 international caps last season. There's no agreement to move him on if things don't happen. He wants to have success here. 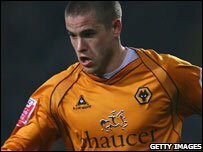 An ankle injury ruined much of his 2007/08 campaign and he was linked with a move to the Premier League after Wolves failed to win promotion. But Moxey insists that was never going to happen. "It ends all the speculation and it really was just speculation," he said. Moxey also quashed the idea that Kightly has an escape clause written into his new deal that would allow him to walk away from the club should they not get promoted. "Nothing could be further from the truth. No provision has been made with Michael in the contract. "There's no agreement to move him on if things don't happen. He wants to have success here both individually and with the team."